As a card-carrying member of the Bruce Whatley fan club, I was excited to discover My Mum's the Best, a story app for iPad. What I liked: I loved the interactivity of this app. It's well-suited to the story, not dominating or distracting from the text, but enhancing it. Navigation is easy. The narrator is Australian and does a great job. But the stand-out features are Whatley's beautiful artwork, and the simple, fun story written by Rosie Smith. The app developers, too, have a sense of humour kids will giggle over - the text on the page about a young bat going to sleep is written upside down. 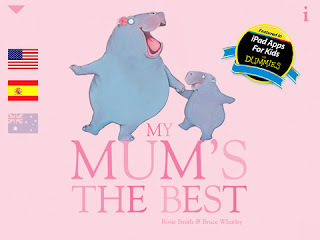 If you're looking for a lovely story with a little interactivity to share with your under fives, check out My Mum's the Best!